The keynote speaker was Los Angeles County Supervisor Don Knabe. Frank Mottek, news broadcaster for KNX Radio, co-emceed the event with Mike Murray of the Long Beach Education Foundation. The event theme this year was "The Blues" with entertainment provided by the Nile’s Project Band, featuring Rod McNeill. Jennifer Rockett, a Renaissance High School graduate and student at Cal State Long Beach, sang with the Nile’s Project Band. The 2013 honorees have dealt with lung transplants, homelessness, brain cancer, death of a loved one, leukemia, rare developmental disease, learning challenges and more. Learn more about the Long Beach Education Foundation. 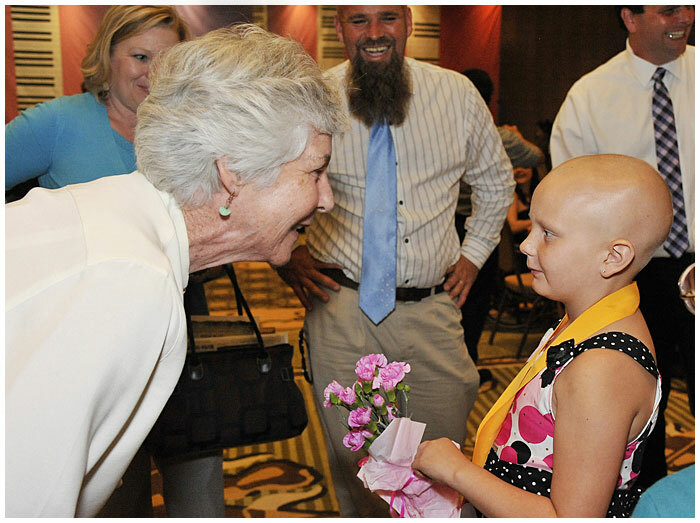 INSPRING – School board member Mary Stanton greets Kettering Elementary School second grader Sydney Waldrop, winner of her school's Most Inspiring Student Award. One student from each local school was honored during the annual dinner at the Long Beach Hilton.